BOOK NOW YOUR HOTEL IN PANAREA, HERE YOU CAN FIND THE BEST OFFERS! CLICK HERE! Panarea is the smallest island of the archipelago. Its surface is 3,3 km² and it is located north-east of Lipari. The present island is just a part of the originary one because the greatest part sank in the sea after a volcanic eruption. The small islands (Basiluzzo, Dattilo, Lisca Bianca) and the islets (Bottaro, Lisca Nera, Panarelli and Le Formiche) belong to the same volcanic complex and represent a little archipelago on their own: they are detached in the surface but linked in depth. Panarea, like all the other islands, has a volcan origin and it is pretty montainous: its highest summit is Timpone (420 metres) called also "Punta Corvo". The western side of Panarea, with its harsh ground is very difficult to reach, the Eastern is full of terraces cultivated with corn and olives. In Cala Junco, you can find evidences of a pre-historical village, witnessing the old origin of the island. Panarea counts around 300 inhabitants almost all living in San Pietro, a port situated in the eastern side of the island. Panarea is one of the most enchanting islands of the archipelago and it is attended by an elite tourism for exclusive holidays. The islands owns amazing seabeds for unforgettable diving. 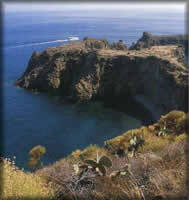 The original name of Panarea was "Euonymos" (left) meaning that it is located eastern of Lipari towards Sicily. Other names were Panarion (destroyed), Pagnaria (cursed), Panaria (loose) and finally Panarea. Thanks to its excellent position and territory, the first inhabitants of the island appeared in the III century B.C. We have evidences of 23 huts witnessing the presence of a pre-historical village on the promontory of Capo Milazzese dating back to the middle Bronze Age (XV-XII century B.C.). In Basiluzzo traces of Roman times were found. The typical cookery of Panarea is based on the excellent fish daily caught and served. Among traditionale dishes, you can find pasta seasoned with swordfish sauce; fried pasta with anchovies, salt, pepper, breadcrumbs. Among second courses you can find dried salted cods with capers, rosemary mullets, fish tomatoes. Traditional desserts are "spicchidedda" made up of wine and cloves, "munnuli cake" based on almonds and the Christmas cakes like "vastedduzzi" (or nacatuli) full of almonds, cinnamon, tangerine water and cloves. excellent position of the island. The rooms are equipped with all comforts.